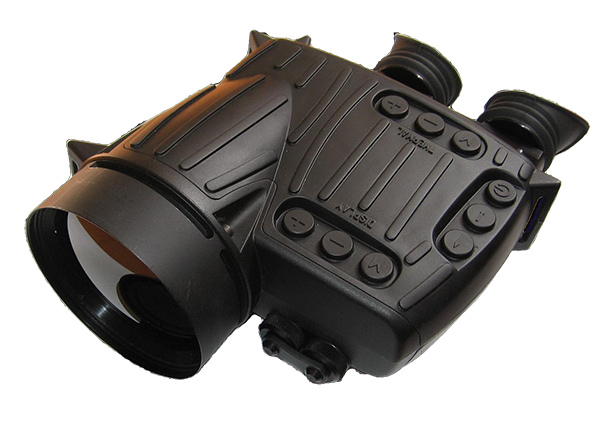 Professional handheld thermal binocular is intended for round-the-clock search, supervision and registration of objects at night and at conditions of smog, fog, and full darkness in the spectral range 8-14 µm. The SND-1 based on the high-resolution uncooled shutterless 17µm microbolometer with 50 Hz frame rate and 640x480 pxls. The device has high-quality optics, video recorder, rubber body and design with IP66 protection. Push button (11) for X2, X4 and 8X digital magnification. Total magnification of device will be 7.4X, 14.8X, 29.6X.